Andre’s thoughtful brother-in-law Dwayne, who is usually more comfortable in the company of a fishing pole than a bouquet of posies, bought roses for each of the ladies in attendance. What a sweet gesture! I wrapped each stem in lavender tissue and tied it with a length of silky ribbon. 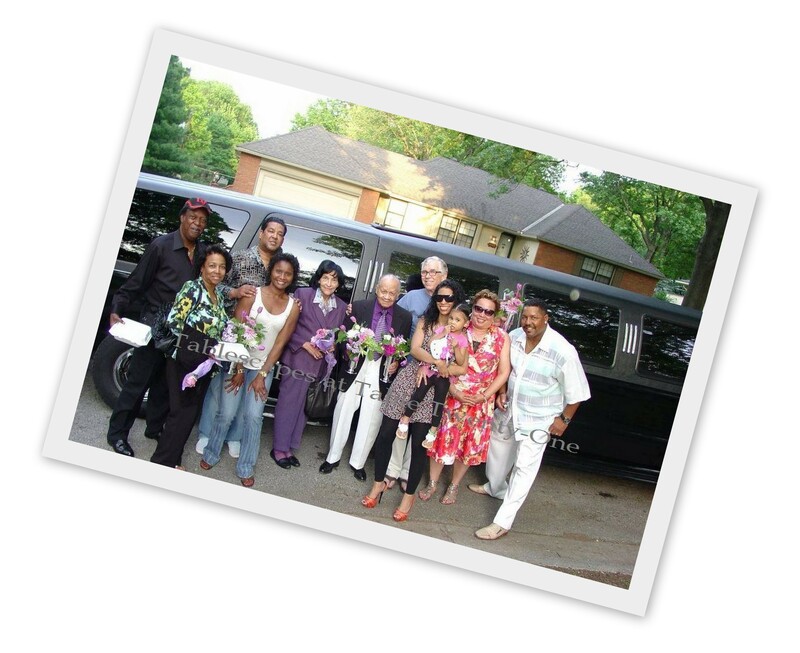 An attendant hired for the day presented a rose to each female guest as she emerged from the limousine that brought them to the party. I sat down with the family to discuss the look they wanted. 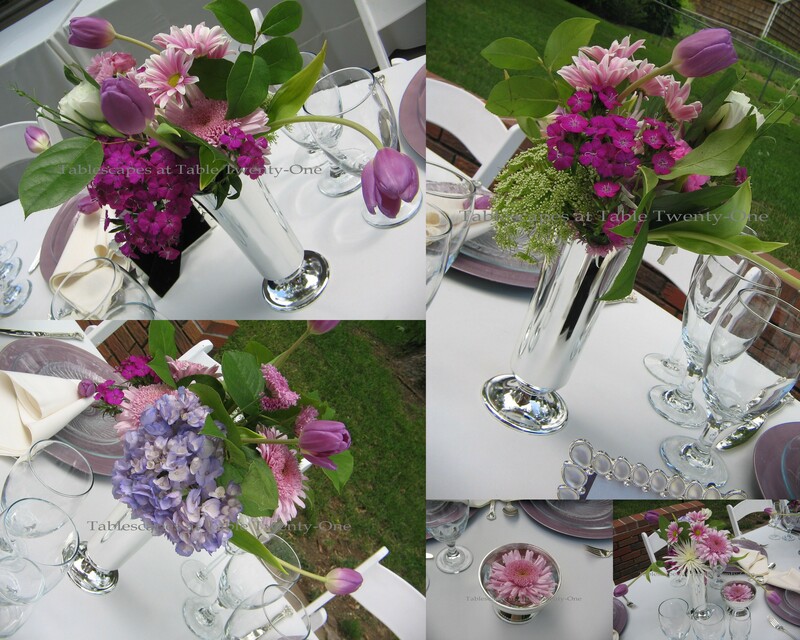 We kicked around a lot of ideas that at first involved a lavender overlay and tall florals. In the end, however, Andre’s description of his Mother’s affinity for “dainty” things kept gnawing at me. 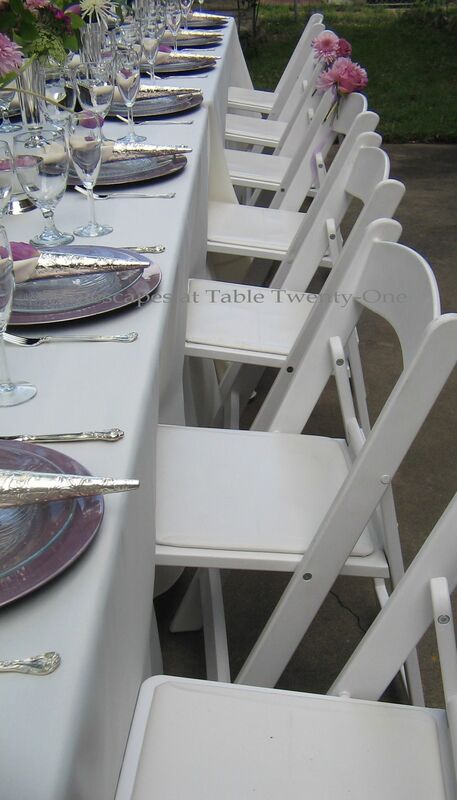 We stuck with the original plan of white wood chairs with comfortable padded seats. 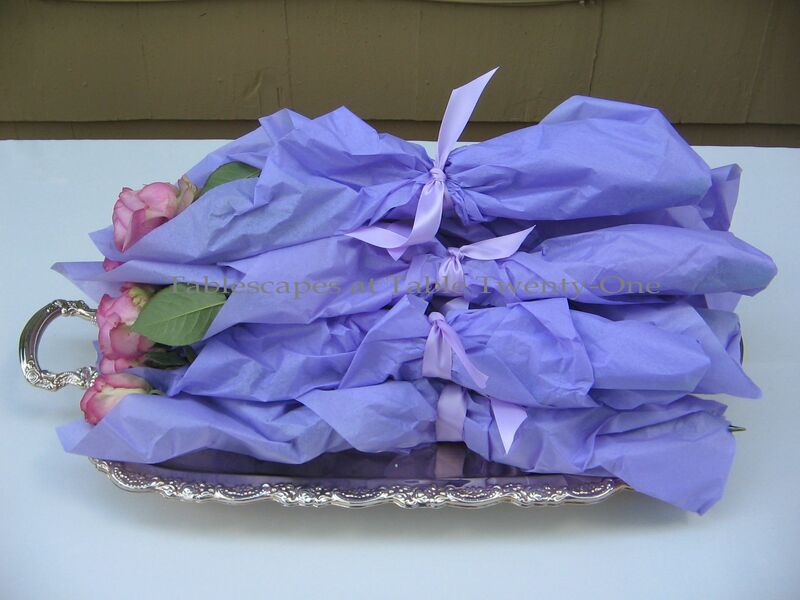 I wanted to capture the Mom’s affection for lavender – a beautiful color for a Mother’s Day celebration – and also lend a few details that would make the tablescape suitable for an anniversary and birthday party. (This table would also work well for a wedding reception or rehearsal dinner.) 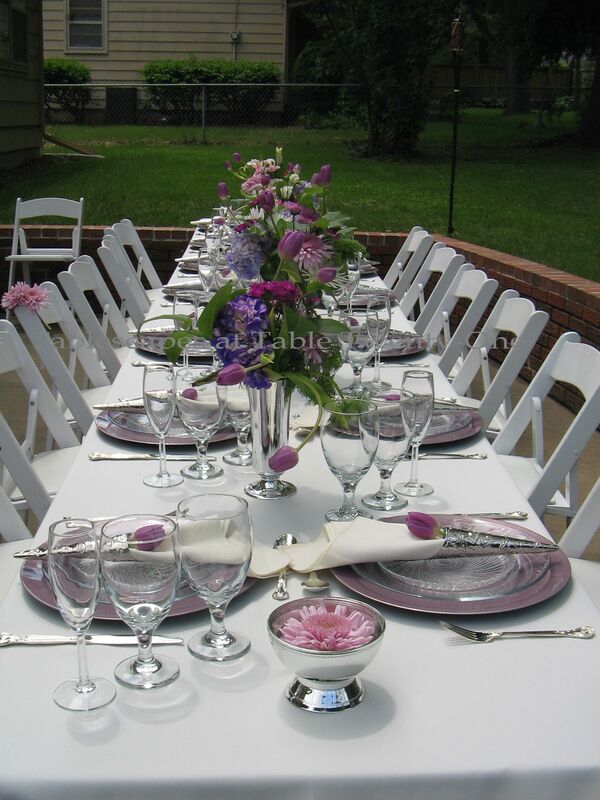 I chose lavender chargers from Michaels, topped with clear dinner and dessert plates from Bed Bath & Beyond. Using clear plates allowed the pleasing color of the charger against the ivory linens to show. The detail of a napkin tucked inside a silver pew cone lent elegance and shine to the center of each plate. I used this same technique for my Mom’s birthday a couple of years ago with equally pretty results. (Click HERE and scroll down to the 3rd post, “Pretty In Pink”, if you’d like to see that.) Demure lavender tulips (inserted into a water pick to keep them fresh) were then slipped in to bring another touch of color to the place setting. I used my silver heirloom flatware to add a bit of design to the tabletop. 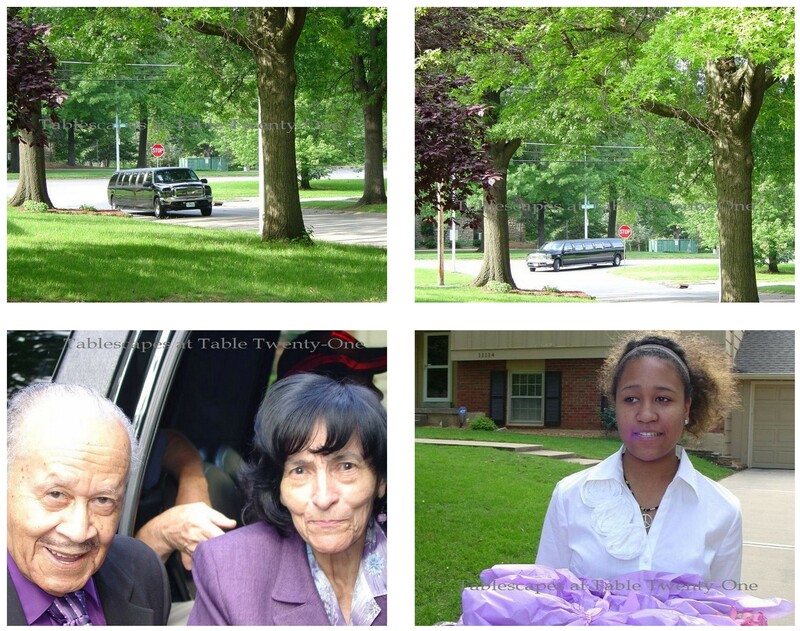 The family wanted the parents’ place settings to stand out while leaving open seating for the other guests. I created place cards on the computer and placed them in pretty silver frames adorned with faux pearls and rhinestones. I also created two pretty nosegays tied and affixed to the parents’ chairs with organza ribbon. With all the other pretty details on the table, I still wanted the florals to be the star. Lots and lots of florals!!! I used a mix of white and lavender cremons, lavender tulips, purple hydrangea, green Queen Anne’s lace, mums and filler flowers to create six unique but complementary bouquets. Scattered between the taller arrangements were floating lavender cremons. The family liked the idea of using faux silver floral vessels so that the ladies could all take a bouquet home with them. No muss, no fuss, and totally undetectable until you touch them! (Yes…those are acrylic vases and bowls!!!) They may sell acrylic floral vessels in stores like Michaels or Hobby Lobby. If not, check with your florist. I have used them for years when the occasion calls for take-home bouquets!!! For a great idea on how to figure out proper spacing for your decorative elements, click HERE and scroll down to Tip #34! Andre laid out quite a spread that besides tasty meats and vegetables included a seafood pasta salad that would send you into an immediate Happy Dance! 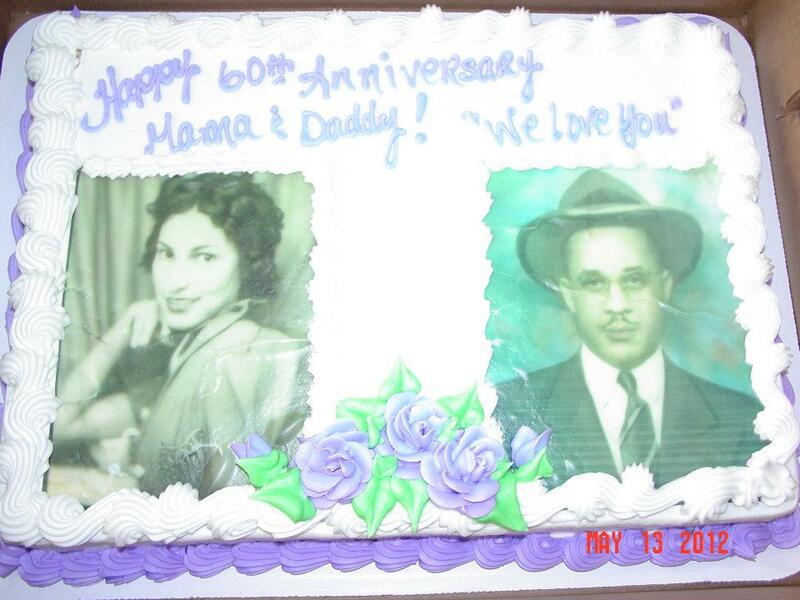 🙂 The beautifully decorated cake, emblazoned with yesteryear photos of the parents, brought lots of “Oohs!” and “Ahs!” from friends and family. It takes a village to raise a child and a team to put on a party!!! Tired but happy to have pulled it off is Team Harper. Front row center: (attendant) Tatum Shelby. Back row: (daughter) Granee Harper Parker, me, (son-in-law/chivalrous guy) Dwayne Parker, (son/caterer extraordinaire who put on a spread that would make a grown man cry) Andre Harper, and Andre’s sweet girlfriend, Trina Collins. Congratulations and best wishes, Mr. and Mrs. Harper!!! You must be very proud of the loving and thoughtful children you have raised! I am joining Cuisine Kathleen’s “Let’s Dish!” and Susan’s “Tablescape Thursday” again this week. I’m also on BeBetsy.com. You are invited to peek in on some of the world’s most talented tablescapers with me! Alycia! Just Stunning! Your attention to detail I’m sure is so appreciated by the guests of honor. I love the silver cones and the flowers are just gorgeous. I think the idea of every lady guest taking home a bunch of flowers is a grand gesture!!! I’m certain is was a wonderful party cause you are the BEST!!! This table is so elegant. The tulip in the silver napkin is the perfect touch. Such an elegant, diary table, proving that less is certainly more. 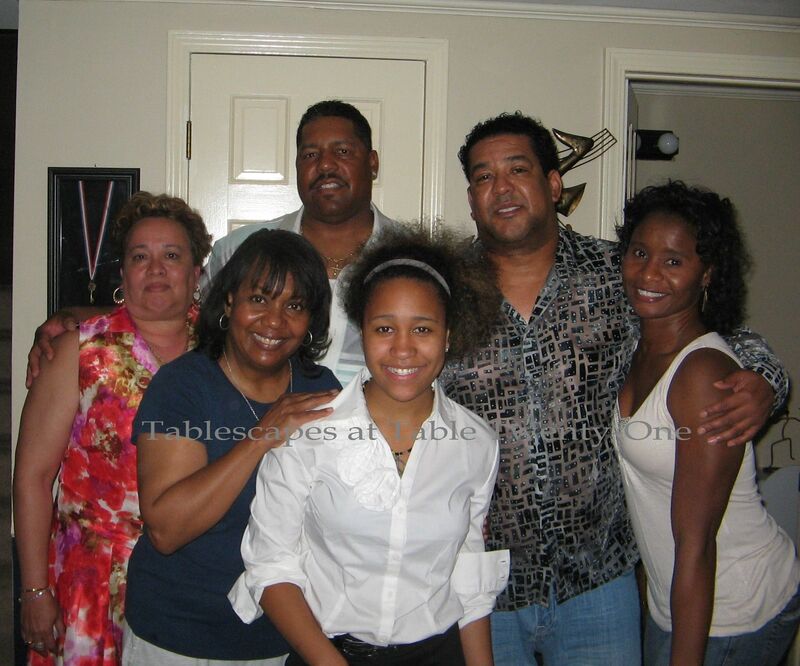 And what a nice looking family — we don’t really appreciate it till we don’t have many people left in our family. You are so good at this, all those little details, like the roses in tissue and the little bouquets. Only one thing missing — that food! Show us the food! that’s “dainty” not dairy or diary — this spell-correct thing that has popped up everywhere is driving me around the bend! What a celebration! I love to see couples who are celebrating those monumental anniversaries. It is such a wonderful thing to celebrate. The table is lovely, as always. Love the lavender chargers…going to have to look for some colored chargers and step away from the “usual” silver and gold that have been around for so long. I love those little pew cones you put the napkins in, too. I love anything sparkly! Thanks for sharing. Hope everyone enjoyed the party! Bravo!!!!! Miss Alycia!!!! Bravo!!!!! You did a stunning job! Love lavendar myself! Wow! What a gorgeous event! Congratulations to Mr. and Mrs. Harper. Oh, how I would have loved to a guest at this party. Not just for the limo ride and flowers, either. I would love to sit at that beautiful table. I have some of those silver cones, and I’ve never even though to put the napkin in them. I’ve put flowers, but not the napkin. That just makes the flower have a stage to sit on. It looks wonderful like that. As usual, I love it. Alycia you did a perfect job on this! All your floral arrangements are top notch! You are so good at making them! 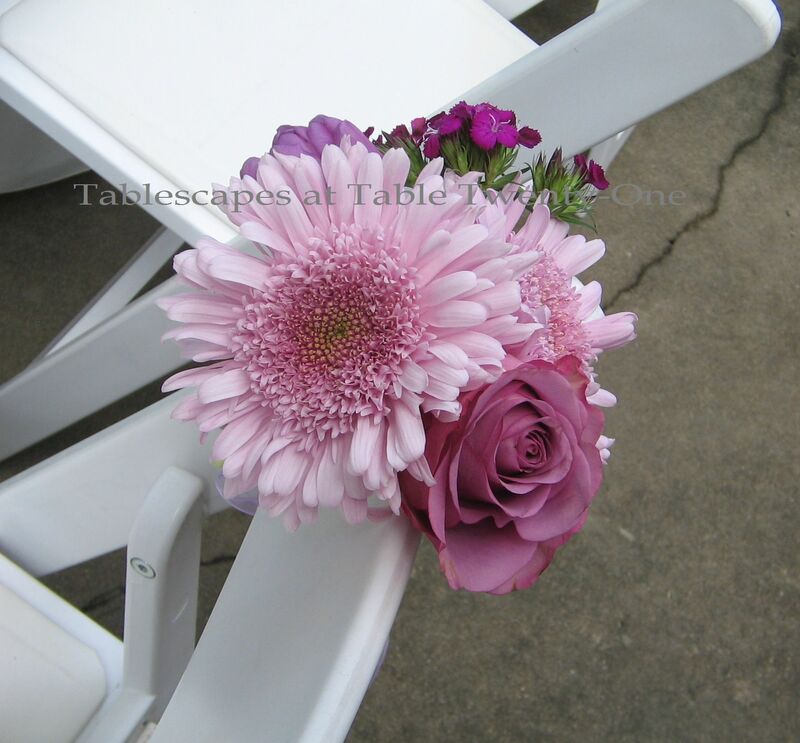 I love the floral accents on the chairs too- what a great way to dress up their spot! 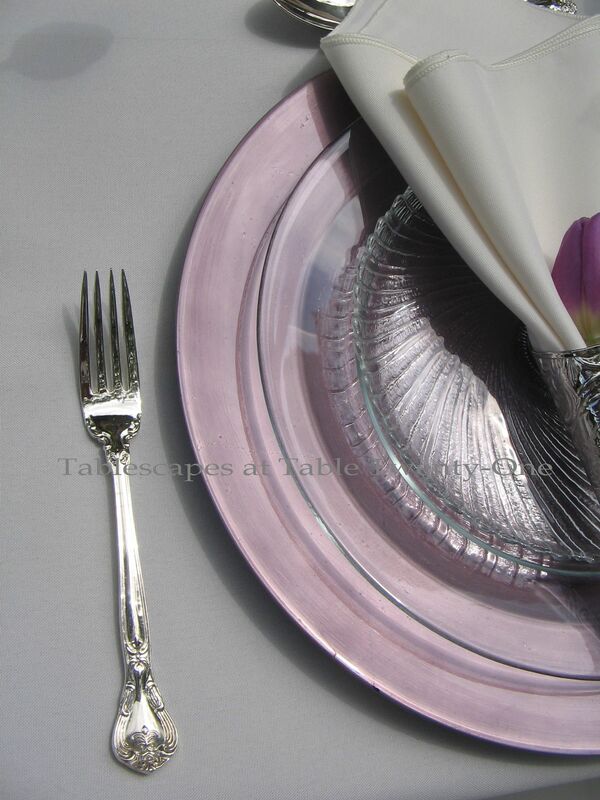 The lavender chargers look excellent with the clear glass plates! 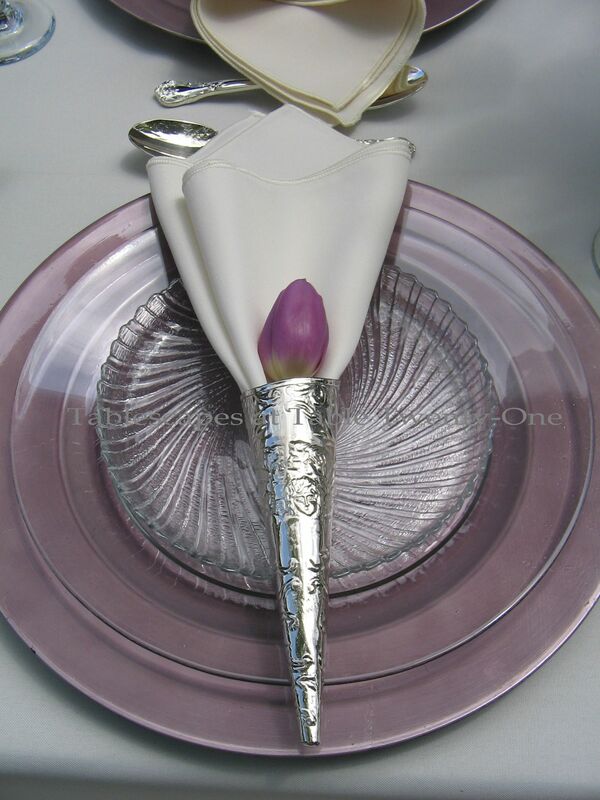 Perfect idea and with the elegant napkin and the lavender tulip tucked in the silver pew cone- so elegant! I like the idea that there were take home bouquets! What a perfect idea for a memorable evening! You did a first class job for them! Absolutely beautiful!!! But everything you do is ALWAYS so beautiful. I so appreciate you giving us the blow by blow account of how you put it all together. That really helps when you would like to do something similar. Can I ask where you get your flowers? Do you go through a wholesaler? They are all gorgeous. The whole thing was. Congrats on another party well done!!! Beautiful……makes me want to plan an event. Love the pairing of the silver, white and lavender. Like the texture on the place setting layer, to0. Subtle, but it really really works…..I think you did a marvelous job. I am running out of words to say WOW. Your tabelscapes are always so gorgeous. The purple and silver is very elegant. Alycia…do you realize that the pictures are like they are right out of an elegant magazine feature?…Oh my, this had knocked my socks off and I am wearing two sets! !….I cannot tell you how much I love this table! !….Now, tell me where I can get my hands on those pew cones…they are magnificent on the plates…Magnificent table Alycia…I am sure that everyone was wowed!!! Simply gorgeous. So blessed to have such talented friends in my life. I know Mr. and Mrs. Harper felt the love that went in to their special day. I’m certain the parents enjoyed the ambiance, the food, the fellowship, and your creativity. You’re the best!!!!! Oh Alycia this one was just gorgeous! This just might be my favorite. Absolutely beautiful table! Gorgeous flowers. You are such a rock star! Alycia, This is fabulous! Simple yet very elegant! 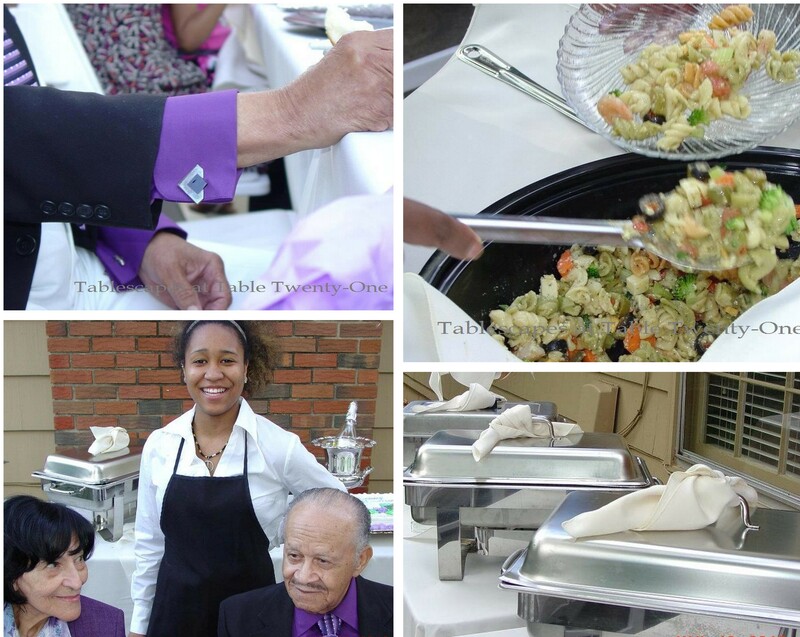 I like the lavender chargers topped with the clear dishes! Thanks so much for sharing! What an amazing event, Alycia! That table is fabulous!! I just LOVE how you used the cones for the napkins, I will def have to remember that! I love the pictures on the cake as well. Just beautiful….I’m sure they were just thrilled! WOW so beautiful!! You are always so creative. The colors are gorgeous. Congrats to the happy couple. You really pulled off the dainty look. I love how the chargers show through the glass plates. I may have to “borrow” that idea! Looks like a really special party and I’m sure they were thrilled with your part in it! Just lovely and elegant. I just started a garden journal so I do not know the name of my awfully invasive poppy. i am beginning to think it is a weed. Everything is just beautiful! All the details are perfect! Alycia, your details for parties are so perfect. I know everyone had a fabulous time. I loved seeing the photos, too. Happy Anniversary to the Harpers! You did a great job, as always, Alycia! It seems like lots of people have used purples lately…I love it. Great table! Love all of the detail!!! The silver cones are spectacular. Just wonderful table. What a beautiful table ~ so elegant and sophisticated. Perfect! Happy Anniversary to a charming couple. May they have many more happy years together. Alycia, the table with all its lovely details is a beautiful tribute for each of these special occasions. Love the silver and lavender touches. What a special table for the Harper family’s special occasions. 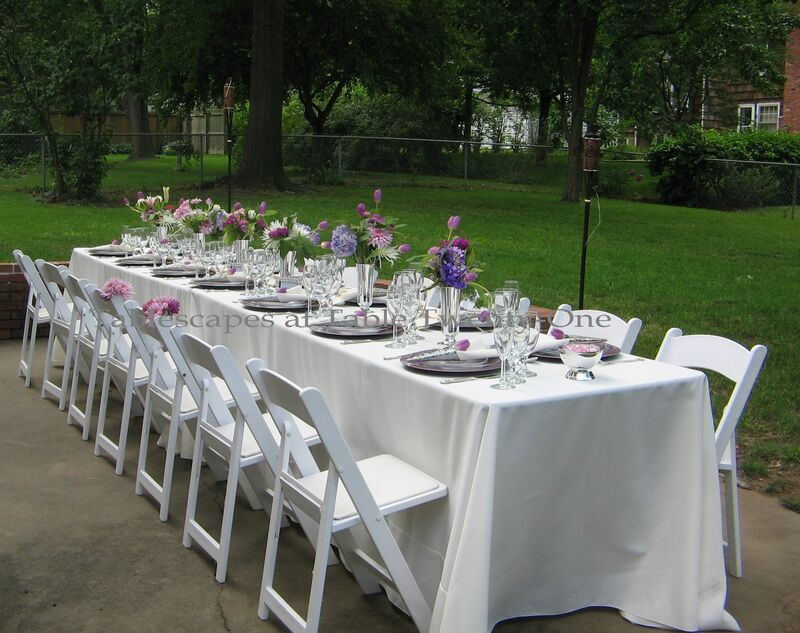 Your attention to detail and thoughtfulness makes the occasion even more special. 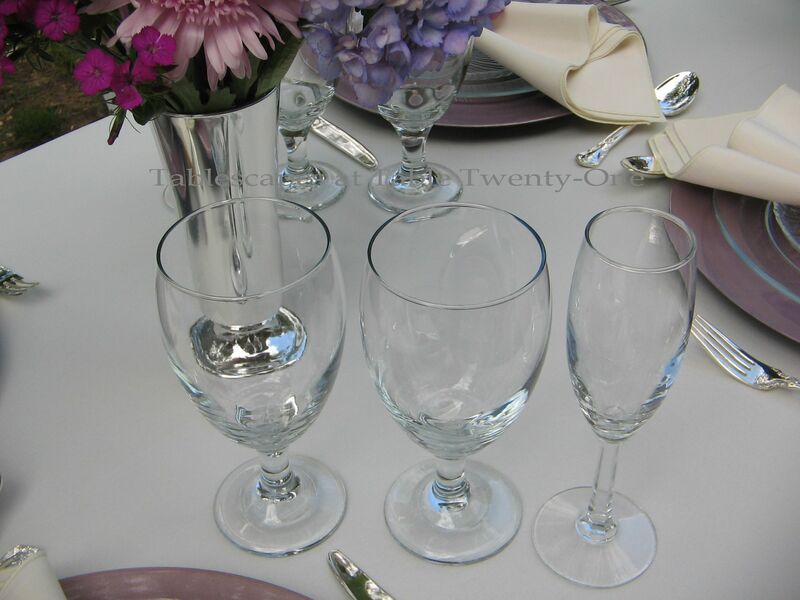 I love your idea of using pew cones for the napkin holder and tulip, and the tip on the silver acrylic flower holders to use for take home bouquets. Thanks to the Harper family for sharing their photos and Happy Anniversary to Mr. and Mrs. Harper. One of the happiest posts, ever! I think all of those smiling faces show how you did on this setting. Those silver pew cones and the flowers are just exquisite! Love that cake, too. I know that the happy couple really enjoyed this special occasion! I need that team! They did a fab job! The colors are so pretty….I can see they worked very hard. The picture of them tired shows how proud they are of what they accomplished for some very special people. I just loved this post! I love to call you this. Hope you don’t mind. So cute to my hearings §;-) if you could hear me saying it to you. Now, we’re talking here. This is really a FAB. You rocks as evah with all the small details. Do you know what? That’s what I get from you? Maybe I have small inexpensive blings but it always remind me of you coz I love the lil extra that make the whole settings different. TY as always for sharing and I am so blessed to know you eventhough thru our blog. I am so happy to know you and everytime you visit me and leave me those beautiful words, I thank you for your support, Lady Aly. It always appreciated and I love every word and everythings’ cherish. Happy Belated Mother’s Day and hope you have a blissful w/end to come. 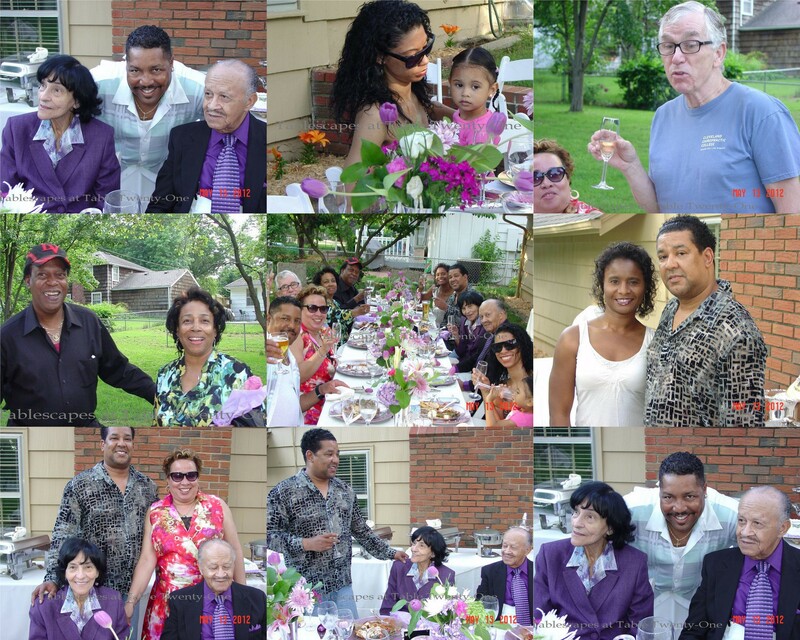 Oh my dearest Alycia…what a wonderful celebration the family had! Your attention to detail is like NO OTHER my friend!! You make such amazing tables, I can’t even imagine…well, that’s why you are a teacher…wish I could go to your classes, really!! I have to just learn from you incredibly beautiful posts. Everyone is so happy and the food looks TDF!!!!! !I should’ve gotten invited, or crushed the party, better…I just didn’t KNOW!!!! The pew cones for the napkins is brilliant, how great they look and so different. Wow, so much blessings for the lucky Harpers. Thank you for your sweet, fun and loving visit to me, I always love when you come. Luv ya!! A fabulous presentation!! Love the use of purple, not overdone. Every thing looks beautiful because of your attention to details. Looks like you gave them an event they will always cherish. Wow, what a party and what an occasion to be part of. 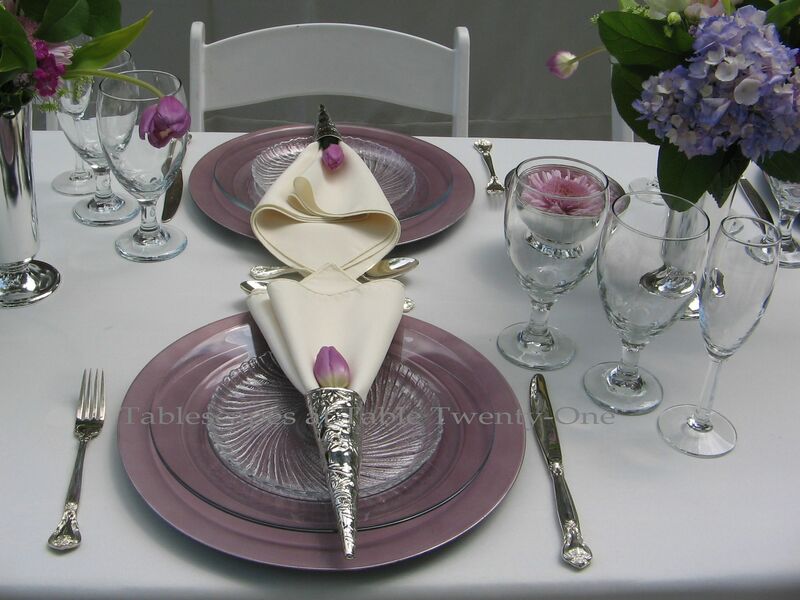 So elegant by keeping with your white linens and the lavender color is perfect. I love an elegant table for a special occasion like this party. You always pay such attention to detail which really makes your tables, I always learn something from each table you touch with those magic fingers of yours. What a beautiful couple. I love Mr’s shirt, you can tell he loves to please the Mrs. Probably why it has lasted 60 years (Bob and I will be married 54yrs this June). The table is just fabulous. Every element is perfect as usual. Tell me about the pew cones. Where can you get those? I love the look with the napkin and tulip. What an event with so much to celebrate. I’d say you honored the mom’s preference for dainty things. Was she as delighted as I’d guess her to be? Your flair and eye for detail is always perfection. You can do my table any time you wish! This is simply elegant… not overdone, just enough. AND I think you captured the “dainty.” That lavender is beautiful with the crisp white linens and just enough silver. Visiting from Let’s Dish. Beautiful, love the colors. The flowers are wonderful, esp the pew holder. I don’t think we have those here. The flowers are usually attached to the pew with ribbon. I have to google those! I am so late making the rounds, but I am finally here! Just gorgeous! I really like that you changed up the flower arrangements. I could just see me driving myself crazy to get them all identical! Love all the traditional white, the purple and silver look wonderful together, and I guess those smiling faces say it all! Wow!! Alycia, every detail was so well thought out!! Sorry I’m late with my comments, but this was definitely worth waiting for!! The design is so coordinated, with such a “delicate”, but elegant look! Flowers are a-maz-ing!! I am still time-challenged, especially now with the kids in and out, my booth at the antique mall, and just normal stuff. I’ve also started working with a trainer to try and get in some sort of shape before bathing suit time, but darn I just can’t seem to eat right lol! I would love to sit down at this gorgeous beauty and chow down. Everyone looks like they had a wonderful time, and who wouldn’t? The pew cones on the plates are just such a great idea, love the cake, and the colors are just so– darn can’t think of an adjective that’s good enough–stunningly serenely beautiful!! Happy 60th to the Harper’s! Awesome! This kind of post is always inspiring. 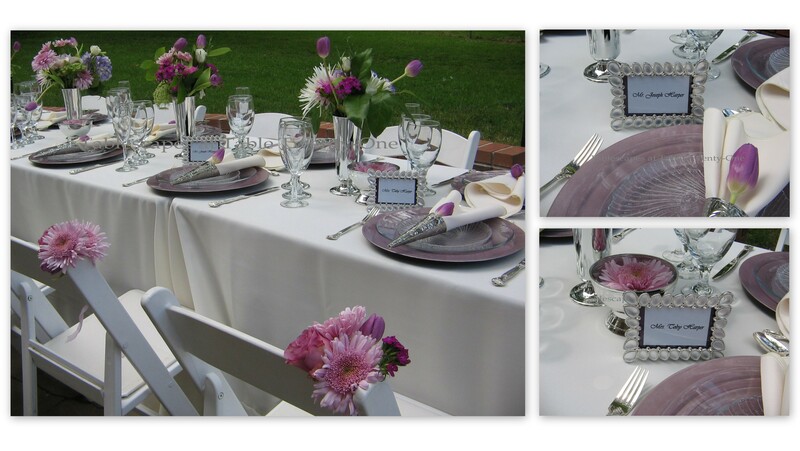 Love the purple-pastel on this tablescape setting. The colors are very delicious to the eyes. Anyway, Happy 60th wedding anniversary. More years to come! You really, REALLY did a Fabulous job on this celebration table, Alycia!! No detail was left out…loved the single flower in the “faux Revere bowl”. I’m going to polish my real one so I can float a pink peony in mine just as soon as they bloom. Thanks for the idea. The tulips inside the pew cones were a beautiful touch, as were the special markers for the guest of honor’s seats. They are as charming today as the day they were married! What a wonderful tribute to much loved parents…they should be very proud of raising such a thoughtful family. Thank you so much for allowing us to share in their celebrations.